Back in March, Konami took steps to dim the visibility of Hideo Kojima's involvement in Metal Gear Solid V: The Phantom Pain by removing his name from marketing materials. It was the result of a not-entirely-happy split between the two, and while it was perhaps a predictable move, it was still ugly in its hamfistedness. And despite the negative reaction among fans who felt that Kojima has been treated rather shabbily throughout, Konami isn't easing up. As picked up by the eagle-eyed NeoGAF, Konami has freleased the final box art for MGS5TPP, and it's missing a key feature that was present on the previously-distributed placeholder art: the words "A Hideo Kojima Game." The art on GameStop, Amazon, and Steam still carry the Kojima name, but it's been scrubbed from images on the Konami website, as well as the official box art images. 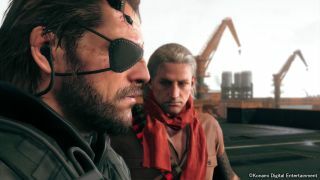 By all appearances, the move is the culmination of an effort to assert Konami's "control" over the Metal Gear franchise, and comes despite a joint statement released in March in which the two parties did their best to put a positive spin on the situation. It's impossible at this early stage to predict what sort of long-term impact the acrimonious split will have on the future of Metal Gear, but right now there doesn't seem to be any question that Konami is making an absolute mess of it. As for Kojima, his time with Konami seems just as clearly to be at an end. What will he do next? Andy (the other one) shares his thoughts on just that question in the wonderfully timed and succinctly titled, What Will Hideo Kojima Do Next?